Mining has been in practice since ages and has given birth to innovations and technology up gradations. 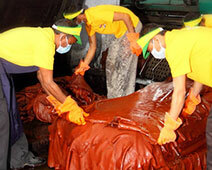 The extracts from mine are widely used in different products and process around the world across different industries. The soul of the entire mining process is the workers who work hard in the critical conditions and give off their security for the sake of work. The process of mining involves deep excavation, digging out the soil, use of heavy equipment and it is very time consuming. It also adds to the process of mineral separation, cutting, breaking minerals and more. Under such circumstances mishap of the falling of heavy object on worker feet, cuts, burns, slip and skid are very common. The safety boots have served as boon to the workers, especially to those who are working at mining site and are frequently exposed to dangers. How Safety Shoes help mining workers? Safety shoes are designed in such a way that it meets the demand of workers of different industries who have to face critical working conditions. Work shoes provided by safety shoes suppliers gives workers comfort of walking and working and protect them against the dangers of minor and major mishaps. 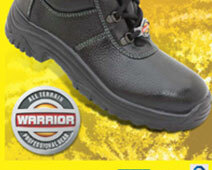 • Easy Excavation with Comfort Walk: Safety shoes help the mining worker to do excavation process easily. They can comfortably walk and stand into them for hours which is required in mining job. • No Slip and Skid: The probability of slip and skid is common but it’s dangerous are defeated with safety shoes. • Protection against Falling Object: The work shoes are robust in nature and have high bearing capacity which makes it strong enough to take the resist the impact of falling object.